Our treatment programme provides your lawn all it needs for healthy growth. We use Professional granular fertilizers formulated to give exactly the right nutrients at the right time. Any weed problems are addressed using a selective herbicide which will ensure you have a weed free lawn. Moss problems are also given special attention with the last treatment of the year, a liquid moss control which has the added benefit of greening up the lawn over the difficult winter months. Let us start by saying that aeration is beneficial for all lawns, no matter what its size or condition. In fact all lawn experts agree that every lawn should be aerated at least once per year. Aeration reduces moss, thatch and compaction. It will also improve drainage and stimulate healthy root growth. Whew the cores arte left on the lawn surface, over time, will break down and provide a valuable top-dressing. Aeration combined with the feeding and weeding of your lawn will vastly improve its health and vitality. 1. Thatch is a dense mat of roots, stems and grass clippings that accumulates between the soil and growing blades of grass. As thatch builds, adequate amounts of vital turf nutrients, including water, oxygen, nitrates, phosphorus and potassium, are unable to reach the root system. Moss then loves to grow on this thatch layer. 2. Scarification effectively removes thatch build-up by "power raking" the lawn turf. 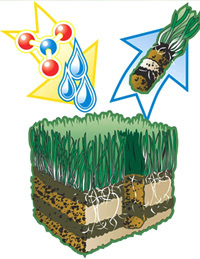 This allows air and nutrients to reach the root system again. 3. With thatch removed, air, water, nutrients, herbicide and pesticides can do their job. Turf becomes healthier and more resistant to insect damage and disease. 4. Scarifying at regular intervals promotes denser growth and helps to ensure you'll have a vibrant lawn.